Cauliflowers (Choux-fleur in french ) look so appealing –their pure white faces peeking through the outer leafing, daring you not to buy them. This is the third time in as many weeks that I’ve succumbed. They usually have to wait awhile to get cooked; often because their green cousin–broccoli–is an easier option. Steamed, seasoned, olive oil and a little lemon juice poured over, broccoli is quick to do and adds a fresh colour to the plate. Tonight though–it’s pasta with the patient cauliflower as the basis of a piquant sauce. 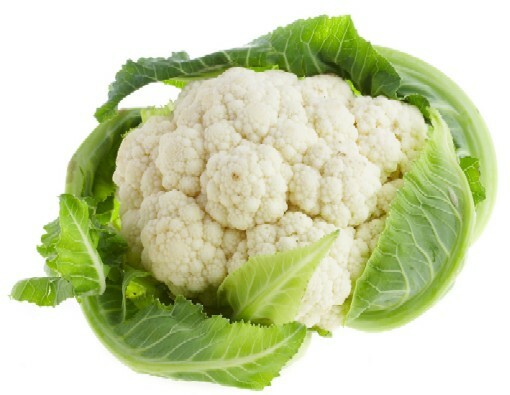 Cook the cauliflower florets in salted boiling water until they are tender. Remove the cauliflower from the pan, saving the water to cook the pasta in later. Heat the oil in a saucepan and add the chopped garlic. Sauté it until it turns colour, then take the pan off the heat and add the anchovy mash and the chillies. Stir this into a sauce. Mix in the cooked cauliflower, breaking it up into small pieces and mashing some of it. Cook it in the sauce for a couple of minutes, then set aside. You are going to gently reheat the mixture just before the pasta is ready. Bring the cauliflower water back to the boil and cook the penne or fafalle to your taste. Drain and add it to sauce in the pan, turning it over carefully but thoroughly. Sprinkle over the breadcrumbs and parsley and serve from a heated bowl. Good to read your response. As regards eating all the time–we’ll have to leave a moment or two for cooking up some more stuff! 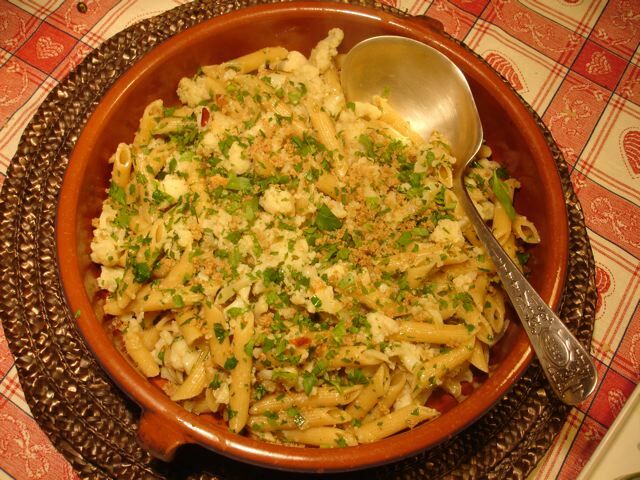 I had a recipe for cauliflower and anchovy sauce with penne that I lost, alas. Cauliflower is coming into season here, and I tried to duplicate the recipe this evening. It was alright, but I was so happy to find your recipe, which sounds exactly what I’d been looking for. Thank you for posting the recipe. You made a cauliflower lover very happy! I’m happy you’re happy, Patty,and you’ve reminded me of the recipe–so thank you.